How to use different schedulers to schedule and execute work. To actually do the work you specified when the network runs, something must take the commands that are ready to go, create an execution environment, and run them. In a TOP network, this is the scheduler node. You can have more than one scheduler in a TOP network, however the scheduler that cooks the network is specified on the TOP network node. Having multiple schedulers allows you to set up different "profiles" and switch between them (for example, a local scheduler for small-scale testing, and a render farm scheduler for full production runs). You can override the scheduler used for certain nodes. This lets you run small jobs and filesystem modifications locally, instead of incurring the overhead of sending them out to a farm. (Some nodes even have an option to do work in the main process, rather than scheduling them at all.) A node can also override certain top-level job parameters. The default scheduler node for new TOP networks schedules work using a process queue. Depending on the workload, this may actually be faster than using a render farm because of the lower overhead. 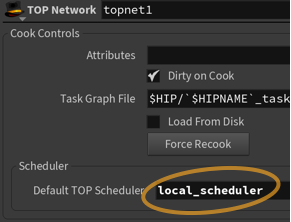 Out of the box, TOPs has built-in scheduler nodes for several render farm packages (see below). TOPs only works with distributed setups where the controlling machine and all servers share a network filesystem. The default scheduler: schedules work using a process queue on the local machine. This is Houdini’s free management software, suitable for small render farms. See how to install HQueue. Compute management toolkit by Thinkbox software. Render management software by Pixar. You can use custom scheduler bindings to integrate other third party or in-house scheduling software. Select the node whose scheduler you want to override. In the parameter editor, click the Schedulers tab. Set the TOP scheduler path to the node path to the scheduler node you want to use. TOP network are often defined entirely at the top level (without subnets), so it’s likely the node is at the same level as the scheduler node, in which case a relative path to the scheduler is just the scheduler node’s name, such as local_scheduler. Alternatively you can click the node chooser icon next to the field to select the scheduler node interactively. This will fill in an absolute path to the scheduler. To revert a node to using the default scheduler specified on the network node, set the node’s TOP scheduler path field to be blank. Schedulers can have individual parameters for how they schedule and execute commands. You can override these settings per-node. Inside the sub-tab, turn on Override job parameters. This shows the set of scheduler parameters you can override. Starting operations in separate processes, scheduling work on the farm, and moving data across the network filesystem all add overhead to work you do in TOPs. Some nodes have options to do small jobs inside the process cooking the graph, and you can override small work items to run on the same maching instead of being scheduled on the farm. Use a ROP Geometry node to generate geometry instead of HDA Processor, and do your wedging using time/frame number. In the same HIP file as your TOP Network, instantiate your asset, and point a ROP Geometry node at the SOP network. On the ROP Geometry node, turn on All Frames in One Batch on the ROP Fetch tab. That will create a single process that cooks the full frame range one frame at a time, which is typically used for simulations but is often more efficient for light-weight geometry jobs. You can also play with a custom batch size. For example, instead of All Frames in One Batch, you could use 20 frames per batch. If possible, you can try using the Invoke node instead of HDA Processor. The Invoke node cooks a SOP chain in the process cooking the graph instead of in its own process. The limitation is that you can only use it on a compiled block. For small/quick operations this is much more efficient. You can also try increasing the number of processes on the local machine in the Local Scheduler. The default maximum is very low (number of cores / 4) to avoid slowing down the local machine, but if you're overriding small jobs to run locally you should probably increase this to the number of cores. On the Local Scheduler, turn on HDAProcessor pool and set it to a number greater than 0. This creates a pool of HDAProcessor instances that will be re-used for HDAProcessor jobs, instead of each new HDAProcessor job running in a separate instance. A future version of Houdini will probably add batching to the HDA Processor so it can cook multiple asset variations (wedges) in a single process, much like the ROP Geometry’s batching mode. Explains the basic concepts behind TOP networks and what you can do with them. How to use the unique network editor features of TOP networks. TOP attributes are like point attributes, You can use them to set parameters in Houdini nodes called by the work items. Best practices for input/output file paths in TOP networks. A quick guide to the most commonly used TOP nodes. It is often necessary to describe in the network what jobs must finish before other jobs can begin. How to cause the TOP network to actually do the work and produce the results specified by the network. How to read external configuration and source data in TOPs and use it to drive work. The Wedge node creates a work item for each variation of one or more attributes you specify. How to wrap external functionality in a TOP node. Work items track the "results" created by their work. Each result is tagged with a type. You can use for-each blocks to process looping, sequential chains of operations on work items. Command blocks let you start up remote processes (such as Houdini or Maya instances), send the server commands, and shut down the server. How to visualize the relative cook times (or file output sizes) of work items in the network. Useful general information and best practices for working with TOPs. The classes and functions in the Python pdg package for working with dependency graphs.